It's Almost Time to Plunge! We've seen a huge jump in registrations and donations over the past 10 days and we want to say thank you! We have well over 110 participants and look forward to meeting their friends, families, and towel holding supporters. And with just over 2 weeks to go to our most famous event of the year, the Polar Plunge Committee wanted to share some important updates. If you have any questions, please reach out at your convenience to the team at polarplunge7930@gmail.com. Click the "Read More" button for important logistics information and hints on raising money. The plunge time is at 11am on Saturday, February 9th. IF we need to reschedule do to weather, the snow date is Saturday, February 16. IF we need to reschedule due to weather, we will first post any schedule changes on our website (www.rotary7930.org) and social media (@rotary7930 and www.facebook.com/RotaryDistrict7930) by 7pm on the night before (February 8th). Hot beverages and snacks will be available FREE. Please remember that this is a family-friendly event. Alcohol is not permitted in the parking areas nor outside. ALL plungers MUST sign a waiver (download waiver here). It GREATLY speeds up check in if you send it to me early at polarplunge7930@gmail.com. Participants MUST check in at the check in trailer. This is also where you'll get a free shirt. The shirt is ONLY free for those pre-registered on Mobile Cause. Sizes are first-come-first served. Participants MUST park at the satellite parking lot at Good Harbor Beach, which is FREE and clearly marked. Free shuttles will be available to bring participants to the Cape Ann Motor Inn. A male and female changing room is available at the Inn but will be very busy! Tip for the beach: wear something on your feet. The sand takes away heat fast as you wait! Any offline donations (those not made via Mobile Cause) should be sent to Amy Luckiewicz to be recorded on your team page. Please send the donor name (or anonymous), gift amount and which page it should be credited to to Amy at polarplunge7930@gmail.com. All off-line donation should be sent to The Rotary Foundation by April 1, 2019. Encourage people to “virtually” plunge instead of going into the water in February. Recruit corporate sponsors for your club’s team. Share your personal Mobile Cause page on all personal and club social media platforms. Recruit a group, sports team, or business to plunge on your club’s behalf. Ask previous donors to increase their gift by 5%. Create recognition levels for donors. Acknowledge all outside donations on your club’s social media and websites as well as personal pages. Highlight the Gates Match! For every $1 we earn for polio, $2 more are donated by the Bill and Melinda Gates Foundation. 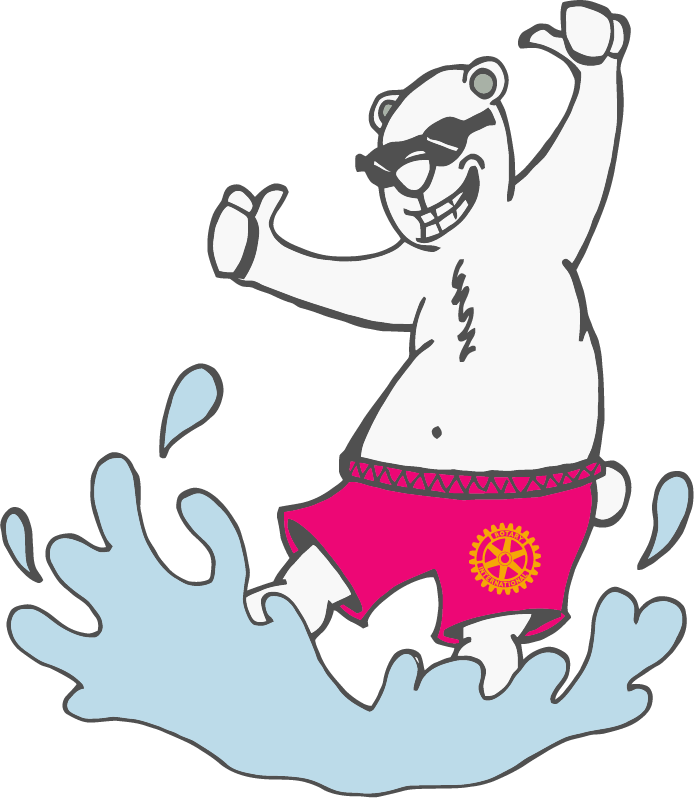 Note that all gifts to our plunge are tax-deductible with a credit card gift to Mobile Cause (or directly to The Rotary Foundation) or with a check made payable to The Rotary Foundation, a 4-Star Charity! Host pre and post Polar Plunge events such as Dine Out for Dollars or Purple Pinkie Days.